Happy! Is the Syfy TV Show Cancelled or Renewed for Season Two? Will Syfy make fans happy or sad? Has the Happy! TV show been cancelled or renewed for a second season on Syfy? The television vulture is watching all the latest cancellation and renewal news, so this page is the place to track the status of Happy! season two. Bookmark it, or subscribe for the latest updates. Remember, the television vulture is watching your shows. Are you? 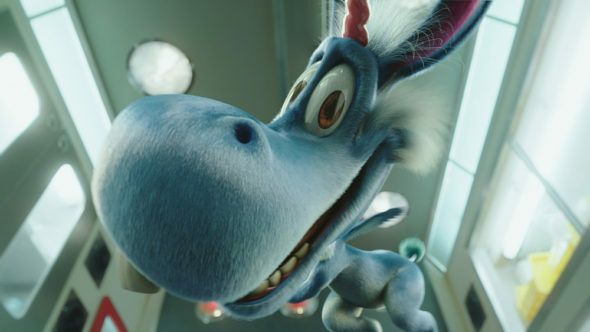 A comedic, fantastical Syfy crime drama, Happy! stars Christopher Meloni with Patton Oswalt (voice), Lili Mirojnick, Joseph Reitman, Medina Senghore, Ritchie Coster, and Patrick Fischler. The first season cast also includes Debi Mazar, Bryce Lorenzo, Ren Colley, Alexander Jameson, Benjamin Snyder, Catherine LeFrere, and Michael Maize. Happy! centers on a former cop, Nick Sax (Meloni). Now a hitman more or less on the skids, Nick finds himself unmoored in a treacherous world full of murder and meaningless hook-ups. One day though, his drunken, depressing existence is turned upside down by Happy (Oswalt), an imaginary unicorn, who is out to save the day. The first season of Happy! averaged a 0.21 rating in the 18-49 demographic and 658,000 viewers. Find out how Happy! stacks up against the other Syfy TV shows. On January 29, 2018, Happy! was renewed for a second season which will debut March 27, 2019. Stay tuned for further updates. Although it premiered with great ratings for a Syfy TV series, the numbers have fallen quite a bit in subsequent weeks. Flying blind, while I’m not averse to a little horse unicorn flesh, or that of a well-marinated detective/hitman, I think Happy! will score a second season renewal. It has something of a built-in audience, thanks to the Grant Morrison and Darick Robertson graphic novel. That said, I reserve the right to change my mind, should it fail to draw a respectable audience. For now, I’ll keep an eye on the Nielsens and update this page with breaking developments. Subscribe for free alerts on any Happy! cancellation or renewal news. 1/29 update: Happy! is renewed for season two on Syfy. Details here. TV show ratings are still important. Follow Happy!‘s weekly ups and downs. Find more Happy! TV series news or other Syfy TV show news. What do you think? Did you hope the Happy! TV show would be renewed for a season two? How would you feel had Syfy cancelled this TV series, instead? More about: Happy!, Happy! : canceled or renewed?, Happy! : ratings, Syfy TV shows: canceled or renewed? Happy! on Syfy: Cancelled or Renewed for Season Three? The Magicians: Is the Syfy TV Show Cancelled or Renewed for Season Five? Deadly Class: Is the Syfy TV Series Cancelled or Renewed for Season Two? Killjoys: Cancelled or Renewed for Season Five on Syfy? I really enjoyed the show. I am truly hoping it returns. Please bring the show back. Now that he has left the girl, he will now move on to …. Well, it’s on SyFy, so if it’s a good series, it’ll be cancelled about 2 or 3 seasons in for no apparent reason. i’ve been burned so many times by SyFy, I’m not even going to bother with this show until it’s been cancelled. i’m in love with the tv show happy. I first started watching it on xfinity and was quit sad when i seen only 6 episodes i watched all of them and thought there has to be another one but im not seeing it. but i give it a 10 rating the best. hoping they continue it. I love Happy!! Need a little buger sugar?That still cracks me up. I got my hubby addicted to the show. So awesome there is a season 2. Love Melon. I use to watch SVU til he left. Happy is my new favorite grimy in your face show. Happy! is a twistedly sick LMAO comedy that I absolutely loved. I cant wait to see Season 2. A comedy for AULTS ONLY that is guaranteed to make you laugh. HATS OFF to everyone involved in the making of this TV series . An absolute enjoyment for those of us with a little sick humor inside of ourselves. Excellent job to the whole inventive crew of Happy! I am over joyed to know the Seasons continue. I would be very disappointed if it was cancelled. Please bring season 2 back this is the most awesome show that I have seen since The Magicians! Please dont cancel the show happy. We love the show.